Rosacea (‘like roses’ in Latin) is a chronic disorder that increases reactivity of the capillaries to heat, leading to flushing and inflamed red papules. Any topical skincare must be supported from the inside to heal and minimise the factors that that worsen this condition, and weaken the skin. 4 TIPS TO SUPPORT YOUR TOPICAL SKINCARE.. INSIDE OUT..
1- REPLACE HEATING FOODS WITH COOLING, CALMING FOODS. Heating foods are vasodilators, that redden and sensitive your skin by increasing blood flow through your fine capillary system. Avoid heating foods such as cayenne, strawberries, peanuts and caffeine. Replace with ginger, almonds, mint and herbal teas. 2- BE AWARE OF HEATING FACTORS. Emotional stress and menopause also heat the skin. External factors like strenuous exercise, sun exposure, hot showers and cooking in the heat will worsen a condition like Rosacea. 3- GUT HEALTH PLAYS A ROLE. Poor digestion is linked with rosacea. Low stomach acid results in intestinal bacterial overgrowth and H Pylori. Eating bitter foods like dark leafy greens, as well as the BESTOW Be Cleanse Powder, is a helpful addition to the diet of rosacea sufferers with digestive issues. 4- NUTRIENTS WE NEED TO SUPPLY…BESTOW BEAUTY. Essential Fatty Acids are essential to treating Rosacea. They are not only anti-inflammatory but they also support the acid mantle which protects the skin from environmental irritants. Use one tablespoon of BESTOW BEAUTY PLUS OIL + BESTOW BEAUTY POWDER everyday mixed into food or a smoothy for maximum absorption. 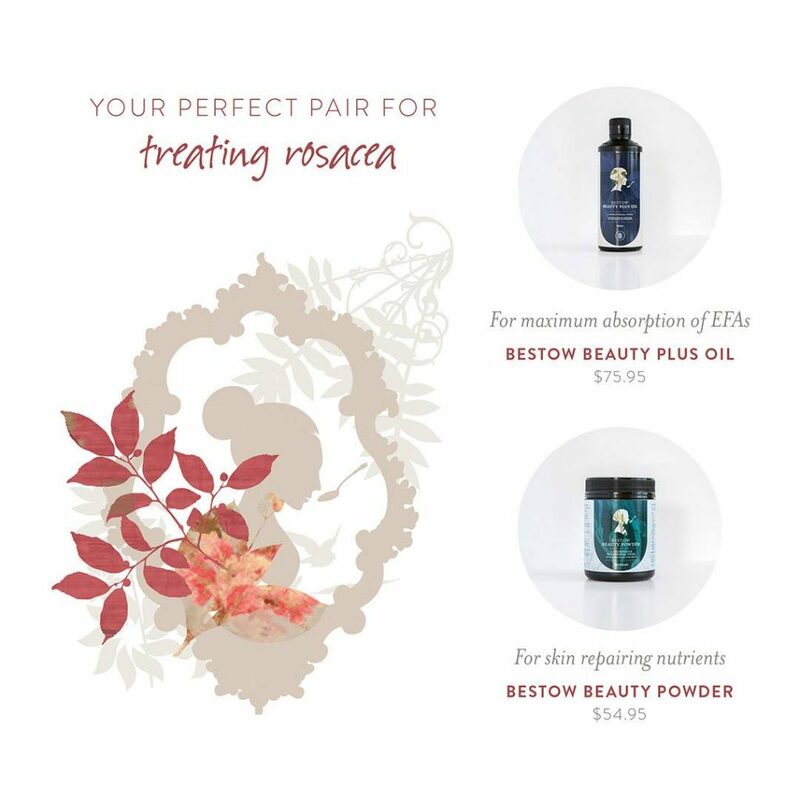 or buy Bestow beauty BeCleanse powder and Bestow Beauty Oil now.